If you enjoyed this post would you consider reading my book? I disagree about the women and men issue. 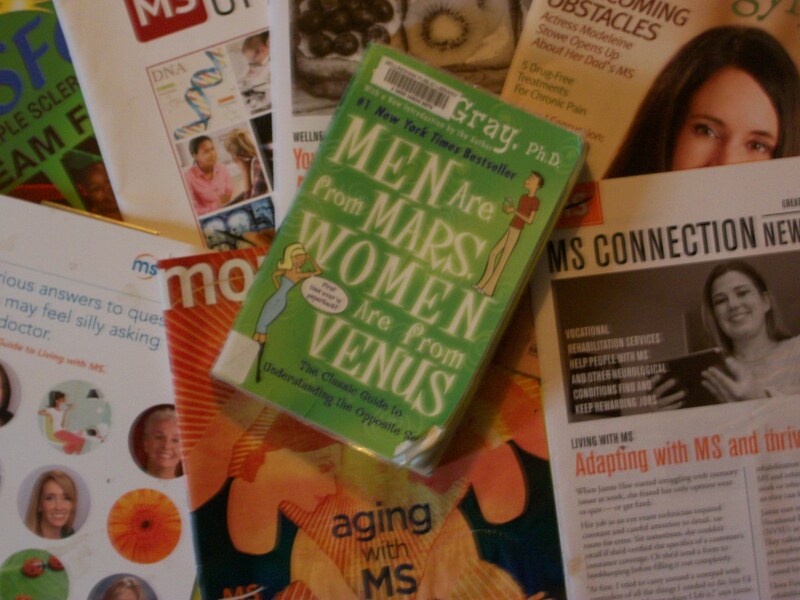 There are just many, many more women with MS so you see all kinds, You might be seeing things from a sexist viewpoint. That’s possible they are just my interpretations that I took straight from the book! I have to agree with Kit on this one, Bill. But then, Kit and I are not housewifey-pretty aproned women who have the luxury of staying at home and seeking empathy from others. Rather, she and I worked all our lives and contributed to the household, at times perhaps carrying the full load, and so in that respect respond more like men from Mars … with anger at those who do not empathize, and then with compassion for their inability to respond with understanding (especially those in the medical professions.) But then, I rejected the mars/venus book outright when I read it … I also disagreed with the male-focused hierarchy of human response … my principal at school once warned me, when one of my students showed a steak knife, that I needed to immediately call him for assistance when that happened rather than talking to my student myself (which I had successfully done and defused the situation without crisis.) His belief was that if things got hot, I would exhibit the human response of self-protection rather than protecting my students … based on Maslow’s hierarchy (which was negated by Carol Gilligan’s work on female hierarachy.) Do you really think I looked for sympathy when I lost my teaching career? I was angry, Bill, and hurt, yes, and I wrote five books about the loss in that first year of retirement. And then I opened my own fabric shop in defiance of those who would suggest that I ought to just quietly resign myself to retirement. I am from Mars, Bill, happily married as I am to a gently, loving, understanding, empathic husband. Well as you said you outright discounted the book when you read it and since the book is also over thirty years old it is quite possible that many things have changed. Thanks for the comment I’ll have to go look on facebook and see how many people either agree or not with the the post. And I never said that I was right, in fact I did say these were just observations and opinion, on my part. And since I’m not female it is quite possible that I do misinterpret things along these lines. Certainly! Share my website with anyone that you would like!